Historical photos of people and places in Crawford County. Contributions of photos of historical interest in Crawford County would be most welcome. If you want to submit a photo, send it to us via Email. Thank you. Index of names for links to the 1908 photos. Railroad Depot in Arion. Five photos, ca. 1912. Main Street Store in Arion before the 1921 fire. Main Street of Aspinwall in the "Good Old Days?" Boyer Store and Post Office on a postcard, ca 1917. Fourth of July, Buck Grove Orchestra, Drug Store and Post Office in 1910, School Souvenir Card from 1896 and the town in days gone by with photos of the Orlando Bicknell Family and the Methodist-Episcopal Sunday School Christmas Souvenir Card from 1897. E. M. Hardy E. M. Hardy and friends, ca. 1905. Charter Oak 1911 Boys and Girls Basketball Teams, 1938 Methodist Sunday School Class. High School Denison High School, 1908. 1939 photo of Denison High School. Country school outside of Denison, where Josiah Linley Adams taught ca. 1875. 1896 Confirmation Class of Denison Zion Lutheran Church with names of young men and women. Four photos from Denison ca. 1920. Post Card with picture of Denison sent to Mrs. Bert Bicknell in 1911. 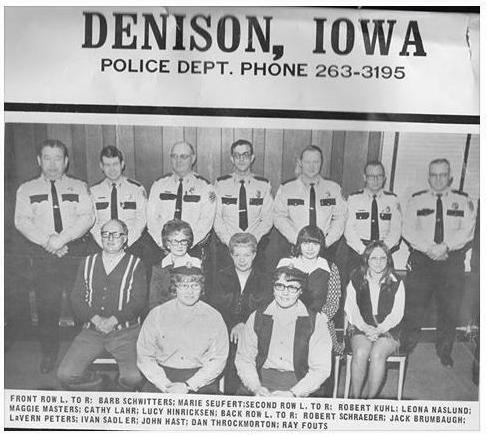 Denison Police Department about 1969. Photo submitted by Larry Luvaas. Two photos of Dow City saloon, ca. 1900, and people in Denison. The Red Quilt handmade by Cora May Jones Schouten. Kiron photo gallery from Glen Gustafson. 1919 The German Lutheran Church. 1914 Cars and People Near Manning. St. Ann's Basketball Team, ca. 1949-1952, Vail, Iowa. St. Ann's 1939 photos of St. Ann's School Grades 1 and 2, and Grades 3 and 4. Young women from Vail High School. Photos of the Westside water tower (1919), Roller Mill (1918) and High School. Penny Postcards from Iowa. Photos on old postcards from many counties in Iowa, including Crawford. Penny Postcards from all U.S. states. Copyright ©2016 by the Crawford County, Iowa, IAGenWeb Project and Contributors.